Family Leguminosae Endl., genus Trifolium L., sect. Hiantia Bobr. It is an annual herb. Stems reach 10-100 cm, mostly furrowed and hollow, ascending or erect, branching from the lower part. The trifoliate leaves have glabrous or hairy petioles; stipules are membranous, ovate-oblong, united below, free portion as long or longer than the united part, those of the upper leaves much shorter. Leaflets are 0.7-1.5 cm long, rhomboidal or ovate-oblong, tapering at the base, spinulose-dentate, apex round-tapering. Peduncles are usually much longer than the leaf. Flower head is axillary, many-flowered, 0.7-1.5 cm across. Flowering calyx lobes are linear-lanceolate, much shorter than the tube, unequal, upper ones much longer. Corolla resupinate, deep pink to purple, fragrant; standard oblong, notched at apex and apiculate in sinus, 6-8 mm long; wings longer than keel and about one-half the length of standard. Fruiting calyces inflated, ovoid or elliptical up to 8 mm long with prominent reticulate venation, diverging from one another. Pods are membranous, lenticular, dehiscing at thickened sutures, one-seeded. Seed are ovoid, brown, about 1.2 mm long. Cross-pollinated, honey bees or leaf-cutter bees (Megachile rotundata) are effective pollinating agents. 2n = 14, 16, 32. This species grows throughout the Caucasus, the Ukraine, the Crimea and Turkmenistan. 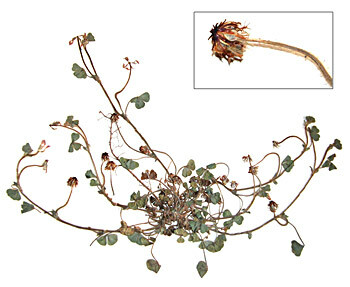 Plant occurs mostly on heavy soils, on fallows and in natural grazing, on roadsides and waste ground. It thrives in a wide range of soils but is best grown under conditions of high fertility; it prefers neutral to alkaline soils and is tolerant of high pH and salinity. It is a valuable forage plant for southern regions. It is grown as a fodder often with irrigation, for hay in its traditional areas. It is highly palatable fresh or dried. Shaftal can be grazed but when it is in pure stand it has a bad reputation for causing bloating for animals. It makes good hay and is easy to cure, although the usual care must be taken to avoid leaf-loss. It is very important locally, in areas with cold winters, and on saline or waterlogged soil. It is not suitable for ensiling because of its high protein and moisture contents. It is highly melliferous.